Although wire often falls under the same category as beading threads like Nymo, the variety of wire types, and the variety of ways in which in can be used for jewelry design, really make it more akin to the beads themselves. From stringing on nylon coated wire, to elaborate bezel techniques, wire is so much more than a simple component. With Creative Wire Jewelry, Israeli designer Ariella Nachshon explores a variety of techniques and styles that incorporate the many different forms of wire available. The projects are chic and stylish, and give plenty of inspiration for jewelry makers of every skill level. Creative Wire Jewelry begins with one of the best beginner sections I have ever seen in a project style beading book. Ariella covers all of the basics, from types of wire, beads and tools, to a full 15 pages on basic techniques, with clear pictures to guide you through the steps. This book presents jewelry making not as a craft, but as a valuable and enjoyable art form that anyone can try. Then it’s on to the projects. There are 22 gorgeous necklace and bracelet designs, plus earrings, brooches, rings and even a beautiful beaded hair comb. Many different types of wire, chain and mesh are combined with everything from beads and gemstones to fabric. The projects are very straightforward, and even beginners will feel encouraged to try them out. My favorite projects are the Fluttering Dragonfly Earrings, with realistic looking wing shapes made from wire, and the Sanctuary at Sea Necklace, with hand-shaped sea creatures and lovely silver chain. They almost make me want to design with metals again! What is your favorite type of jewelry or beading wire? One entry will be chosen at random on Monday, June 27th. If you do not have a Blogger profile with email contact enabled, be sure to leave a contact link (website, shop, Facebook, etc.) 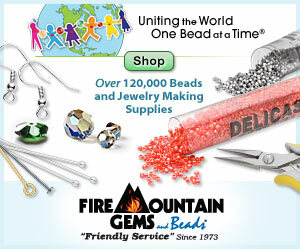 or email address (beadlover AT yourmail.com), so I can get in touch with you if you win. I would like to thank Sixth & Spring Books and SOHO Publishing for giving me the opportunity to review and enjoy this book. Inspirational Beading has not received paid compensation for featuring products in this post. I have shared my sincere opinions of this book. Sounds like a cool book. I like to work with galvanized steel wire. I love the patina it has when you rub off the black coating. And it is so strong! Thanks for sharing. Enjoy the day! THis is the second book of this kind I see.I have even bought one /by Kate Pullen/ to get interested a little in the issue.The Israeli designers are real specialist in this area,also conserning seed beads jewels.I saw many their designs and I can say,I was seriously impressed. But...yhm...to tell the truth,this is not my cup of tea at all:-)Maybe because I have allergy on various metals:-(I do not like connecting seed bead jewels to metal endings or pieces of chains,or so called 'magnetic closures'.It sounds a little profanation of this art to me.But some wire patterns i.e. gemstones connected to wire constructions can sometimes be very artistic. I also don't work much with wire. I have a couple of books that are actually pretty lame. This one sounds wonderful. My favorite wire to work with? 20 gauge sterling silver - makes perfect ear wires! The pictures of the chains are so beautiful. What great artistry. And to think that I can learn this. Thank you for doing the giveaway. It sounds like a neat book, especially that beginning part (which is exactly what I need!). Thanks for the giveaway! MY favorite jewelry is chain mail. I love all the intricate weaves and the endless possibilities to combine them. For my wire beaded women's kippot, I use 20 gauge wire. For my jewelrys I prefer to use wire. It works best for me. Thanks for your wonderful giveaways! A few months ago, when I decided to start making my own jewelries, I started searching through the internet for techniques. It was then that I first found out about chainmaille. I just got stuck. Until now I have only experimented with copper and arzanto wire, as they are cheaper. But I'm very interested in wire work in general as well. This giveaway is just great. Congratulations on your blog, I really enjoy it. Looks like a great book! I am getting into using colored craft wire, in addition to the usual 20 gauge sterling wire. I just found your blog. I love it! The wire book sounds really interesting. I mostly work with seed beads, but have been wanting to try some wire work. Congratulations to Sally, and thank you so much to everyone who entered! I like to use copper wire, and do both chain maille and wire work.